Find the way to achieve true Christian growth into a life of confidence and fruitfulness. This kind of teaching was the reason Paul wrote his letter to the Colossian church. He recognised the fall-out of 'moving on' from the gospel – we become unsure of God's forgiveness because it no longer depends solely on Jesus; we become proud of what we do; and ultimately, these new spiritualities completely fail to deliver the new life that they promise. Colossians is the 3rd study in this series that we've used with our group of non-native speakers. These questions are clear and make it easier to understand and apply the text. It's led to meaningful and helpful discussions. We love this series and hope to use more guides. 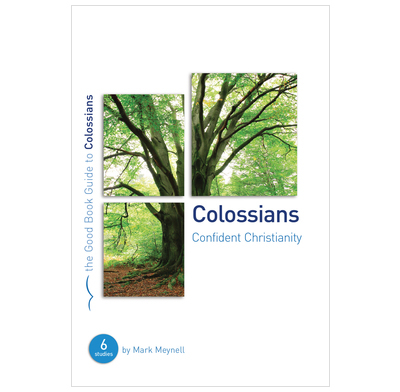 This is a handy booklet to use as a basis for study of Colossians. It is very structured and keeps closely to the bible text. There are questions to consider related to the text and the author gives their answers to the questions at the back of the book. I particularly liked the introductory ice- breaker question at the beginning of each section, as this invited free discussion. Some of the less open questions rather narrowed conversation down. Maybe if you were doing this study with a group of theological students then it could work, but my wife and I are leading a Bible study group for young parents who aren't very far on in their Christian walk, haven't had much solid teaching all their lives, and this study was just too complicated for them. In fact we ended up not doing it. Even I found the questions rather difficult to wrap my mind around. We are using the "Confident Christianity" for our House Group Study and so far have found it inspiring and certainly thought provoking. it was ok but the questions are again very contrived (this is not the first itme I have found this with the GB gudies. I am an evangelist so get what you are trying to do.. but it is borderline patronising and also can be irrelevant in churches where the mission field is a real mixed bag.. and not full of oxbridge students and academics with 'fine sounding arguments (session 3) The friends of my small group members are not arguing their position so in a sense it sounds like we 'protest too much' .. ie it felt like a course on how to evangelise more than a celebration of who we are in Christ. If we know who we are in Christ then the evangelism will follow naturally,... I felt the passages had been highjacked by a specific agenda.. and belive me this is also my agenda... I love evangelism.. but it was 'too much' for members of my small group... and a tad simplistitc and patronising for the older members..
A super starting point for planning Bible studies on Colossians or for using exactly as printed. questions not easy to understand by younge christians, would allso be better if leader book seperate. In a men's (10-12)study group I found it took two meetings, of approx.1 hour each, for each of the 6 studies. Some questions could have been put better, e.g. 3/5, 3/12, 6/11. Felt the stoicheia verses deserved more attention. NIV's 'basic principles' might be easily passed over but 'elemental spirits...' (NRSV+)seems to present a different challenge, especially in the light of Col. 1:16, 20. We are in the middle of the study. We are all finding it helping, although not all the questions are. A well laid out and easily navigable study guide. Material is clearly presented, the language down-to-earth and direct, and the study sections are of a suitable length for both one-to-ones and group studies. Questions are 'open', thought provoking, and they promote helpful discussion. The leader's guide, in it's own section at the back of the booklet, provides helpful themes and application aims. This is a good, clear, user-friendly study guide, which I highly recommend.